From the color of the frame to the feel of the handlebars, a child’s first bicycle is something they will remember long into adulthood. Beep Bicycle Bells aims to add a little bit of personality and an important safety feature to a kid’s favorite set of wheels. Handmade and painted, their cheerful bicycle bells are created from steel without the use of any plastic. The glaze used to paint each bell is completely non-toxic and weatherproof. With a diameter of 54mm and a height of 25mm, bells may be easily mounted with a simple bracket clasp. In addition to being environmentally conscious, Beep Bicycle Bells strives to remain true to its morals by providing disadvantaged members of the community with employment fashioning the bells. These personable bells, with designs ranging from pirates and aliens to tweeting birds and flowers, offer a fun way to greet friends along the road or make new ones on the way. From the color of the frame to the feel of the handlebars, a child's first bicycle is something they will remember long into adulthood. Beep Bicycle Bells aims to add a little bit of personality and an important safety feature to a kid's favorite set of wheels. Handmade and painted, their cheerful bicycle bells are created from steel without the use of any plastic. The glaze used to paint each bell is completely non-toxic and weatherproof. With a diameter of 54mm and a height of 25mm, bells may be easily mounted with a simple bracket clasp. In addition to being environmentally conscious, Beep Bicycle Bells strives to remain true to its morals by providing disadvantaged members of the community with employment fashioning the bells. 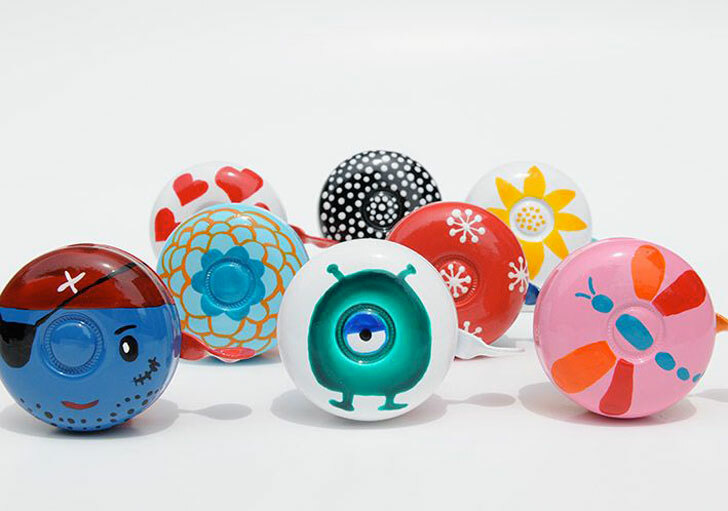 These personable bells, with designs ranging from pirates and aliens to tweeting birds and flowers, offer a fun way to greet friends along the road or make new ones on the way.